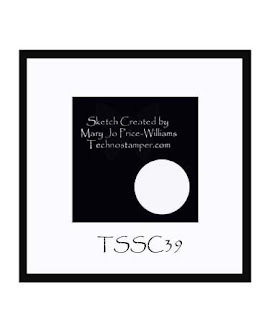 Another Monday....Another TechnoStamper Sketch Challenge....This is an easy sketch this week, and I choose to make my center panel just a tad larger to accommodate my Snowflake #2 die that I punched with my Big Shot. I love the colors in this card - and may just have to use them for an upcoming Bloggers Challenge to see what the rest of the players come up with. On to the details of my card....I rolled my Christmas Chatter Wheel in my Chocolate Chip ink, then across my Baja Breeze card stock, repeating as necessary. Sponge edges with Baja Breeze ink, layer on Chocolate Chip panel, then Baja Breeze 5-1/4" x 5-1/4" base card. I punched my Snowflake #2 die from Shimmer card stock using my Big Shot, adhered a Rhinestone brad, placed a dimensional on the back, then placed on my base card. The snowmen are from Holiday Lineup, stamped in Black, then colored with markers and ink, punched with the 1-3/4" circle punch, then layered on a piece of chocolate card stock that was cut with my coluzzle. If you need to order any of the supplies listed above to create this card you can order them here. Here's MJ's original sketch if you'd like to play along. Simply leave a link to your project here on this blog post, or if uploading to SCS, use keyword TSSC39. Luvin' every part of this....great layout for that large die! Very cute card Lisa! Love these colors. Looooooooooove it!!! these are great colors! I adore this. I did not want this snowflake at all and now over the last two days this is the third incredible card I have seen with it and of course I now want it. Darling card, Lisa, thanks for playing. Excellent card, Lisa! I can't wait to get that snowflake die! Your card is so festive and cheery, I love it! Great card Lisa! I love the snowman. I really like this one! Great card color choices and I love the little snowman peeking out there LOL! Your blog is beautiful! love the snowflake card! Lisa: love, love, love this card! 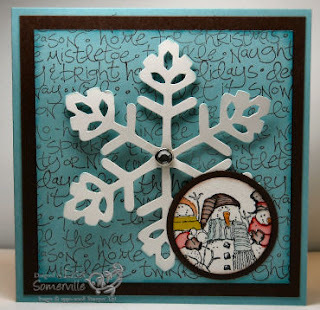 Love how you made the snowflake the focal image on this card. Now I must get this die. Lisa - Love your site and especially love this card. It was exactly what I needed for my hostess club. You can see my version at www.cateredcrop.typepad.com, 12/7/08 post. Thanks for the inspiration!